The menu comes in two stages – the laminated one they hand to you at the table and the specials on the wall. Choose from a variety of tapas – the usual ones are all there (see our other post for details) – there are also main courses like grilled sea bass, steak and chips and red tilapia. 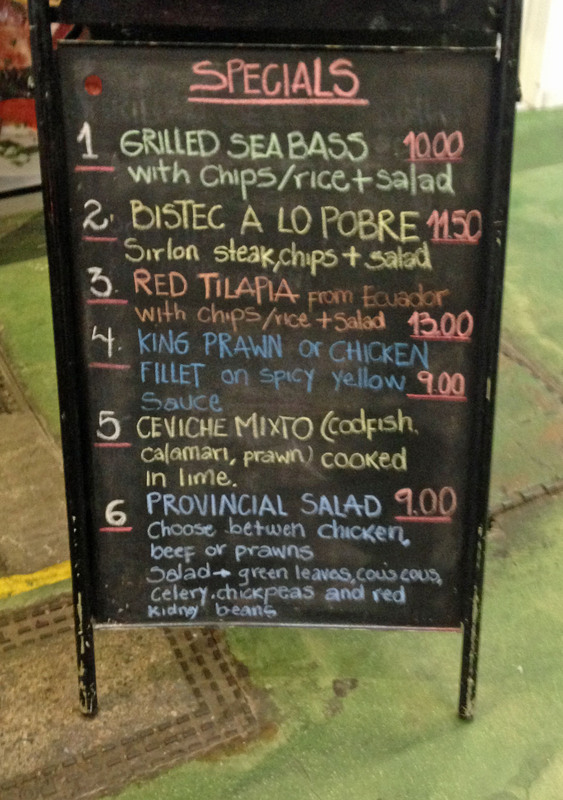 But we were here on a mission and surprisingly we had two types of ceviche to choose from. The ceviche mixto has cod, prawns and calamari and the normal (pronounced normal) just has the cod – we chose one of each. Ceviche is a raw fish dish that is “cooked” with lime juice and, although some suggest that it should be kept overnight, we have eaten this dish a very short time after preparation with no ill effects. There is an addition of onion, coriander and chili as well as salt. In Peru it would usually be served with a lump of sweet potato and this is the only part of the dish that is served warm. We were not disappointed it was exactly as we had hoped. The bright orange lump of sweet potato and the small portion of salad leaves gave the dish colour and the portion of ceviche was large – definitely a main course size. Now to the taste – we were not surprised with the first mouthful which was subtle at first and then fiery with the chili. As we continued to eat we realised that we had made one poor choice -where we had decided to sit. The only really comfortable tables and chairs were inside and we sat in the gloomy corner. This is no problem usually but it doesn’t allow enough light to spot the chili. Now I am used to red and green ones which would be easy to spot against the white fish. As we ate we got hotter and hotter and the burn became worse and worse – I thought this came from the little green bits which I began to separate out but clearly they were just the coriander. The heat actually came from some little yellow sections which (foolishly) I popped into my mouth and sucked to see it this was where the heat came from ……………… with obvious results. These little blighters were scotch bonnet peppers and after weeping I still couldn’t speak for ten minutes or so and only after several swigs of beer and water. We washed it down with beer – a Columbian Club (I would describe it as subtle but my partner thought was bland) and a Cruz Campo. This place is still not faddy even with the addition of specials. Most food is hearty and looked good. The waiting service has certainly improved, although from our vantage point in the corner we noticed that empty tables were still not cleared quickly sometimes not until new customers arrived. We got the food we ordered and in a reasonable time – not what it has been renowned for. We cannot vouch for a complicated order but there was an absence of arguments which happened when we were last there. The bill came to £26.50 for two people. We are planning a return trip to retry the rest of the menu and perhaps even the ceviche but forewarned this time and with pockets of tissues just in case.